Providence Sister Diane Ris, who served as the 16th general superior of the Sisters of Providence of Saint Mary-of-the-Woods, died on Feb. 20 in Mother Theodore Hall on the campus of the order’s motherhouse in St. Mary-of-the-Woods. She was 80. The Mass of Christian Burial was celebrated on Feb. 26 at the Church of the Immaculate Conception at the motherhouse. Burial followed at the sisters’ cemetery. Sister Diane was general superior when Blessed John Paul II beatified Mother Theodore Guérin, who founded the Sisters of Providence, in 1998. Beatification is the last major step before a person is declared a saint. Mother Theodore was canonized in 2006 by Pope Benedict XVI. At the time of Mother Theodore’s beatification, Sister Diane expressed her admiration of her order’s founder. Sister Diane, whose religious name was previously Sister Martin Therese, was born on July 16, 1932, in Port Chester, N.Y. She entered the Sisters of Providence on July 21, 1951, and professed perpetual vows on Jan. 23, 1959. She earned a bachelor’s degree in education from Saint Mary-of-the-Woods College, a master’s degree in elementary education from Indiana University in Bloomington and a doctorate in the same field from Ball State University in Muncie, Ind. 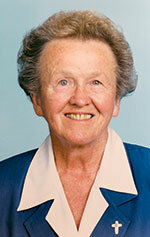 Sister Diane served as an educator in several Catholic schools in Illinois, Indiana, Kentucky and Maryland. In the archdiocese, she ministered at St. Susanna School in Plainfield and the former St. Patrick School in Indianapolis. She also served for 20 years as a professor at Morehead State University in Morehead, Ky., and received the Distinguished Teacher Award, the school’s highest faculty honor, in 1989. She was elected general superior of the Sisters of Providence in 1996, and served in that position until 2001. Surviving are two sisters, Linda VanDenBerg of Jacksonville, Fla., and Peggy Joneas of Memphis, Tenn.